The coffee masters over at the ModernBarista.com did the legwork for us, figuring out which cookies work best with which core Starbucks coffees. For those of you who have been long time readers of this site, you know I’m good friends with Jocelyn, also known as “The Modern Barista“. 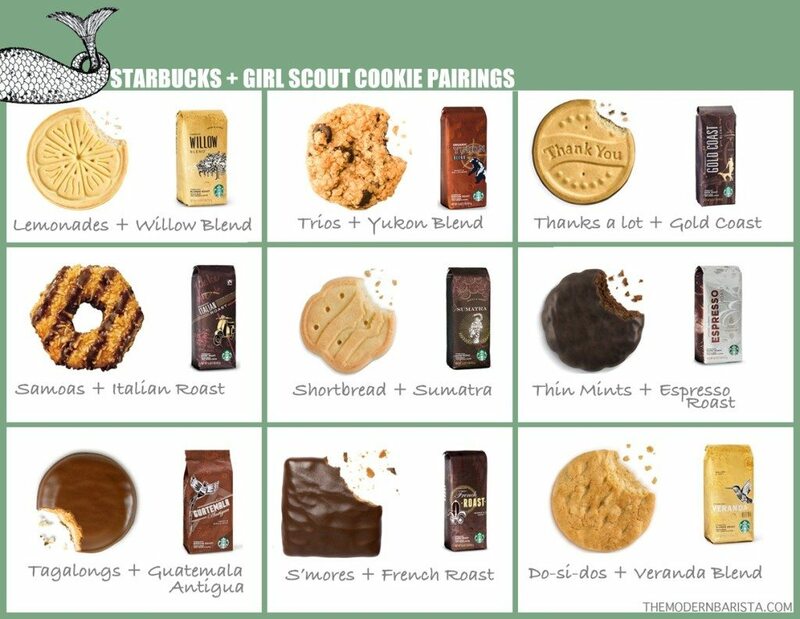 The credit goes to her for figuring this amazing Girl-Scout-Cookie-and-Coffee-Grid out, and generously sharing it here. This was delicious! You will like this! The Do-Si-Dos are a fairly mellow cookie and won’t overpower the soft and gentle Blonde Roast profile Veranda Blend. The nuttiness of Veranda Blend works perfectly with peanut flavors found in Do-Si-Dos. 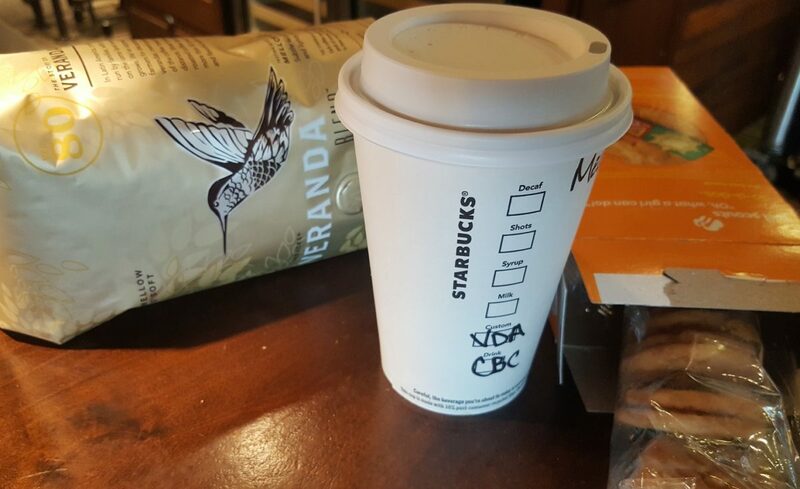 I ordered my coffee Clover brewed to get lots of flavor from the Veranda Blend, but you could try this with the typical paper filter-brewed Veranda that is usually offered daily in the morning at Starbucks stores everywhere in the United States. 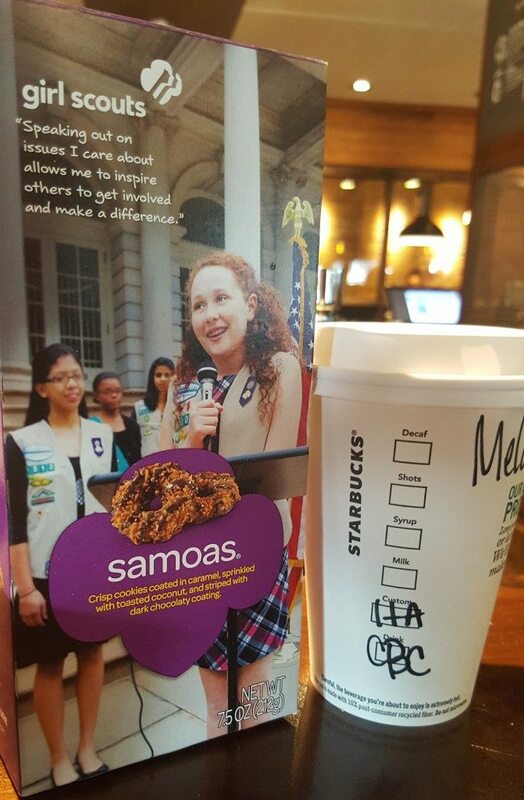 I decided to try the core Starbucks Italian Roast Coffee with the Somas cookies. For consistency, again the brew method for the Italian Roast was the Clover brewer. When I was trying this pairing, this store’s store manager (Ben) dropped by my table and sat down for a minute. We shared cookies and coffee. (I poured some of my Italian Roast into a tasting cup – his timing was perfect.). This is the Starbucks way! Connect over coffee. 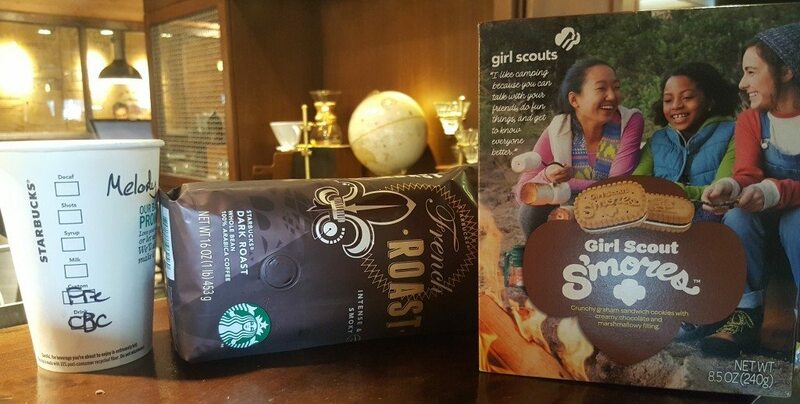 Ben, the store manager, immediately said to me that he thought it was a very good pairing, and thought that the cookies did a great job of bring out the caramelly sweetness of Italian Roast. Coincidentally, another partner at this store mentioned that he used Somoas with Espresso Roast for his coffee master certification, years ago. I only tried it with Italian Roast, but I think you could try it with either Italian or Espresso. In a pinch, grab some Italian Roast Via. This was a lot of fun too. The minty aspect of the cookies brought a complexity to Espresso Roast. Espresso Roast is a very dark, sweet, and caramelly coffee. The sweetness of the cookie works great with Espresso Roast! Definitely try this one to amp up your Espresso Roast! Sometimes people forget that you can definitely brew Espresso Roast as a drip coffee. It is delicious as just a cup of coffee. For consistency, this again was a Clover-brewed cup of coffee. French Roast is known for having a marshmally, dark smooth and sweet flavor profile. It is the darkest of all the Starbucks coffees. For most any coffee retailer, French Roast is the signature ‘darkest-roast-profile-you-can-get-before-the-beans-catch-on-fire‘ at 475-degrees in the roaster. No joke. If you look carefully at a Starbucks bag of French Roast, it has the number 475 on the packaging, representing the ultra hot roasting temperature. The marshmallow center of the Girl Scout S’mores cookie is what made this work! It works well with French Roast. I would have loved to try the chocolate covered version of S’mores with French, but unfortunately that’s not available in Seattle. The buttery cookie wafers mellow the French Roast coffee. This was a great pairing too! 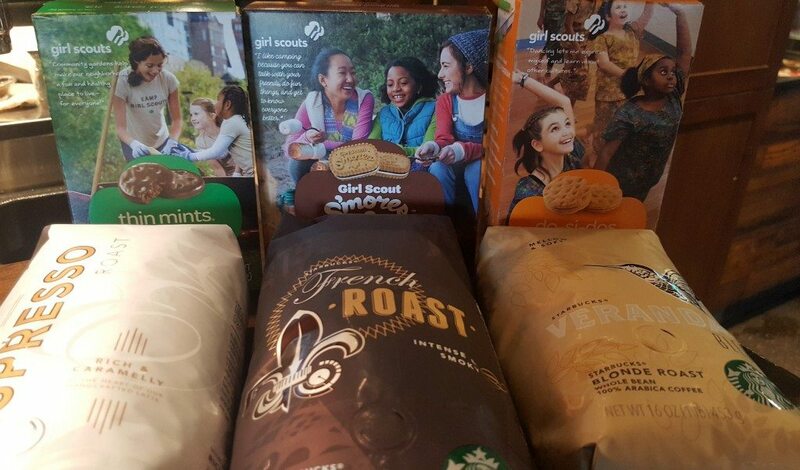 Now we’ve got you started: You have the Girl Scout Cookie coffee tasting guide and some thoughts on Girl Scout Cookies and Starbucks.It’s your turn. Let me know which pairings you try or if you have your own pairing ideas! Earth Day at Starbucks: Free Reusable Cup to the first 25 Customers. GIVEAWAY: Starbucks RESERVE Christmas Coffee. Which cookie goes good with Medium roasts? I really like Pike place do you have a recommendation for me? The Starbucks morning muffin is awesome! It has nuts, whole grains and everything else inncredble to eat in the morning. Good Starbucks!